Anne Arundel County Recreation and Park’s Jug Bay Wetlands Sanctuary and Glendening Nature Preserve offer a beautiful array of meadows, forests, rivers, marsh lands, and streams. 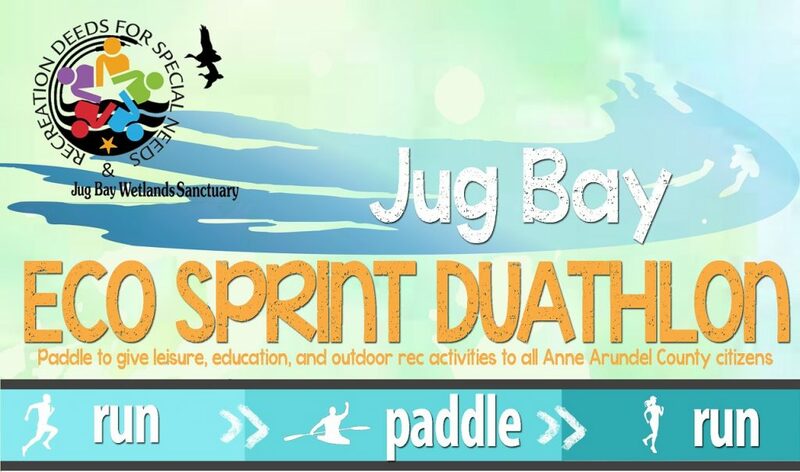 Join Rec Deeds for Special Needs & the Friends of Jug Bay for the first annual Jug Bay Eco Duathlon as you explore this stunning landscape. Race as an individual or grab a team mate for this grand adventure supporting a great cause. You can use your own kayak or stand up paddle board, or rent one of ours. We have a limited number available for rent. Registration is limited to 100 individuals/teams, so don’t wait! The event will be held rain or shine, and entry fees are non-refundable. In the event of inclement weather, the race director reserves the right to modify the race course as needed to ensure a safe environment. Enjoy the forested trails of Jug Bay Wetlands Sanctuary for a 2 mile run, followed by a 1 mile journey paddling along the bluffs of the Patuxent River on your kayak or SUP. Once back to shore you will finish up the race with another 2 mile run along the same bluff ridge you paddled below. Race shirts will be guaranteed to all participants who register by August 25th (sizes and availability cannot be guaranteed after the 25th). Water stations out on the course and at the finish, as well as course marshals guiding you on the route. Packets will be available for pick up on Saturday, September 9 from 7-8 AM at Patuxent Wetland Park (race location). Grass parking is available at River Farm.